Recently, I have received some pushback on my interpretation of Ephesians 5-6. The locus of the controversy has been my post “The Head of Man“, in which I state husbands practice a submissive love towards their wives. This submissive love is rooted in the way Christ submitted himself to humanity on the cross. This serves as my template for juxtaposing the Ephesian household code with Roman household codes. Specifically, the issue has been with my belief that Scripture supports a model of submission centered in Christ. Many have been comfortable with Jesus submitting to the Father. However, it creates a great deal of discomfort when you say Jesus, the creator God of the universe, submitted himself to human beings. Yet, I posit that this is a strongly biblical statement and can be sufficiently demonstrated by appeal to a representative sampling of Scripture. To accomplish this, I offer three passages I believe create an excellent paradigm for examining this claim. This is a fairly familiar story to the average Bible reader. The mother of James and John, sons of Zebedee, approaches Jesus. To add a bit of depth, we can look to a parallel account in Mark 10, which tells us she wasn’t working solo. In fact, in Mark’s Gospel it is James and John who make the approach,indicating there was some collusion taking place. Whoever did the speaking, the request itself was simple enough. Jesus had said he would be ushering in God’s Kingdom and the disciples assumed this would be a physical kingdom, restoring the former glory of Israel and placing them as rulers over the nations. As such, James and John wanted in on the action. If Jesus was going to be king of the revitalized Israelite empire, they wanted to be his co-rulers, sitting on his right and left side. [W]hoever wishes to be great among you must be your servant, and whoever wishes to be first among you must be your slave; just as the Son of Man came not to be served but to serve, and to give his life a ransom for many. Did you catch that? The greatest and first in this Kingdom will be he who demotes himself to the level of a servant and a slave. Why should they do this? Because the Son of Man (Jesus), the one who is truly greatest and first, is doing this amongst them. He has come to be servant his death that will be a ransom for many. I want to focus for a second on verse 28, where Jesus says that being “slave of all” is an action in imitation of his death on the cross. In recent conversations, I have been told the text says Jesus died “for” many. However, such a reading elevates an English translation above the meaning of the Greek original. Here, the meaning of the word “for” is not implying that Jesus loves me for the sake of Scripture. Instead, I know that he loves me, for I have read the story in Scripture. Logically, “for” implies a causation between reading Scripture and understanding Jesus’ love. Now returning to Matthew 20:28, anti serves a similar function. Because Jesus has come not to be served, but to serve he gives his life as a ransom. But the “for” in the Greek tells us that how we understand this ransom is found in the act of “serving” Jesus undertakes. The words “just as” indicate it is the greatest who becomes servant and the first that becomes slave of all – and that is Jesus! A servant and a slave, by their very nature and status submit them self to those they serve. So if Jesus is slave of “all” then in the cross he is submitting to “all”. This point can be driven home by considering Jesus could have called a legion of angels to prevent his arrest (Matt 26:53). He could have, at any moment, told Pilate to buzz off and walked away (John 19:11). He submitted to these things that he might be humbled, humiliated, beaten, tortured, spit upon, and mocked. The creator God of the universe was abandoned and weak, killed as a curse upon the cross (1 Cor 1:18-31; Gal 3:13; cf Rev 5). He submitted to us, allowed us to kill him, that he might give us life from death. But John does something radically different here. Jesus gets up from the table, strips to his undergarments and sits on the floor at the disciples’ feet. He assumes the position of a slave, and begins to wash their feet. This leaves Peter miffed. Jesus is supposed to be a conquering king, so why in the world would he humiliate himself like this? Why would he choose to be submissive, when he has the right to rule? 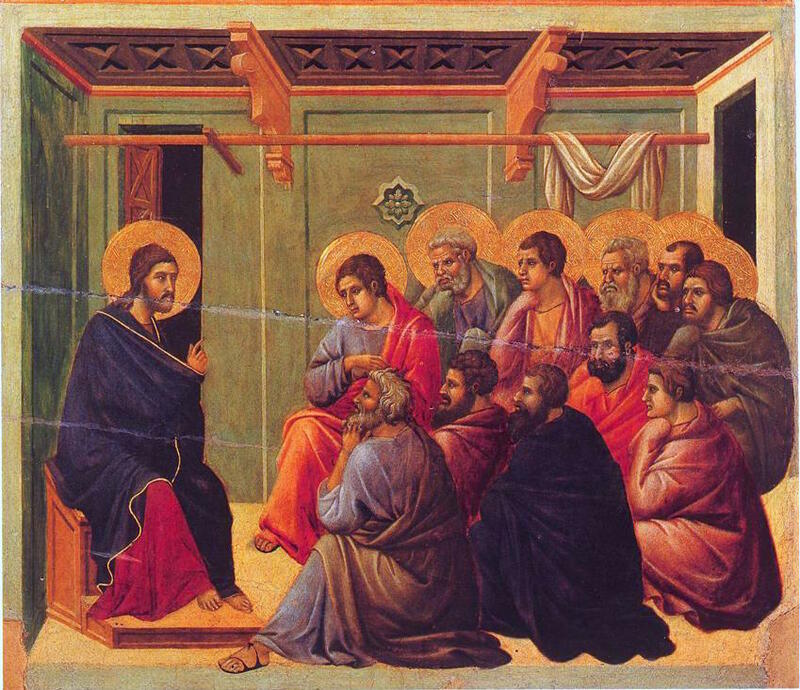 He then addressed all the disciples, explaining that his actions are an example for them. If Jesus, their Lord, would submit to them in this fashion they ought to be willing to do the same for others/each other (vv. 12-15). After this, the supper commences, Jesus predicts his betrayal, and Judas takes off to carry out the deed. But don’t miss it. 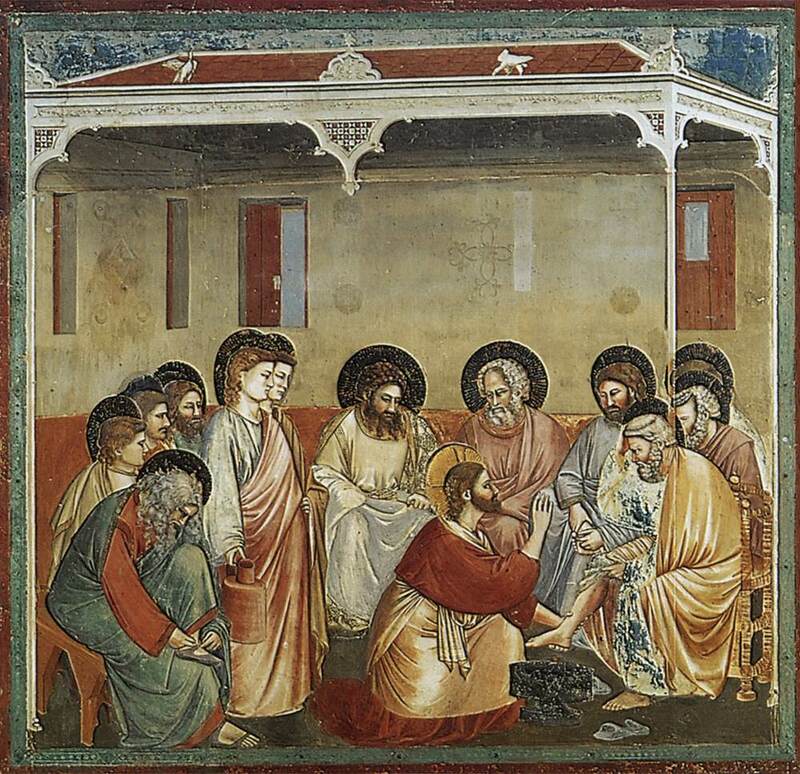 John chose the image of Jesus as slave, washing feet as a substitute for the traditional Eucharistic formula. He fully intended this to be a metaphor for Jesus as the crucified Christ. He is saying, if you want to understand who Jesus is, what he did, and how to imitate it, you have to remember the Jesus who washes feet. As I said before, one cannot assume the position of slave without being submissive to those served and according to Jesus if we refuse to accept him as a slave washing feet we reject him entirely. In order to accomplish this, they must be humble, they must lay aside selfish endeavors and personal privilege and seek to elevate others above themselves (v. 3-4). This, Paul insists, is accomplished by being of the same mind as Christ. Jesus was in his very essence God, yet chose to instead become human. In fact, as a human Jesus took the form of a slave. He fully embraced this role, submitting himself to death – even to death as one accursed and abandoned, a rebel and a blasphemer (vv. 6-8; cf Gal 3:13, Matt 27:32-56). It is for this reason that God restored Jesus to his rightful place through resurrection and gave him the name that is above all names. In case you are unclear, that name for Paul – a devout Pharisaic Jew – is Yahweh (vv. 7-11). Before we return to Ephesians 5-6, let’s recap. Paul tells the Philippian church that Christian love that places others above self is the same love shown first to them by Jesus the Christ (cf. 1 John 4:7-21). This Jesus became as a slave – he submitted to death on a cross. We have the words of Christ in Matthew 20 and his actions in John 13 to help us interpret what Paul means by “slave”. Jesus modeled this “slave status” by submitting to the 12 at the Last Supper in the act of foot washing. He submitted to human beings as an Ancient Near Eastern slave submitted to his master(s), human beings whose number (12) represents Israel fulfilled and the Church moving forward. In doing so, Jesus modeled for his disciples the principle expounded in Matthew 20. John makes sure we connect this with Jesus crucifixion by placing it as the first event of the Eucharist feast. This is no insignificant statement. Paul is laying out the interpretive framework for the entire passage. In Greco-Roman society, the man was head over all in his household. He literally was considered to own his wife, children, and all servants/slaves. He was considered the pater familias, or family patriarch. He was essentially the emperor of his home, which was a microcosm for the empire. As “emperor” he held the power over life and death for those in his charge. Yet, as Paul begins he roots his Christian household code in worship of Christ. Thus, the man must love his wife just as Christ loved the Church. Jesus did this by giving himself up for the Church to redeem her to himself, to make her holy. In case you don’t understand what Paul is saying, husbands must model the love of Christ crucified. And since Paul had already told us what this love looks like, we know it is a love of submission and service (vv. 25-27). According to verses 28-33, this is also to be understood through the concept of “One Flesh” from Genesis 2. According to Paul no man hates his body. This means – if the marriage couple is of the same body metaphorically in the way Adam and Eve were literally – he cannot harm or mistreat her without hurting himself as well. This, we are told, is analogous to how Christ loves his body, the Church. Thus, again, this love is brought back to the cross. It is a love which sacrifices self for the betterment of the beloved. It is a love of submission and directly undermines the hierarchy of a patriarchal society. But let’s keep fleshing this out. It will be noted, I skipped verses 22-24. First, the wife is to submit to her husband as a model of Christ’s headship. Just as Christ is head because he is Savior of the Church, so the husband is head of his wife. Here, again, headship is entirely rooted in the cross. It is tied to the husband’s command to love. What is going on here is the fulfilment of verse 21 – a mutual submission rooted in the person of the crucified Christ. We can further see this as the passage continues. In 6:1-4 children must obey their father’s authority. But lest you think he is thus patriarch, Paul states he does not have absolute power over their lives. He cannot abuse them, he cannot be a tyrant (cf. Matt 20). Instead he must bring them up in the way of the Lord. And that way is laid out in verse 21, mutual submission rooted in the person and works of the crucified Christ. Lastly, in verses 5-9 we have instructions for slavery. I’m going to be honest. There is slavery in the Bible, it is part of the assumed social climate of both the NT and OT era. There are sections of the Bible that condemn the practice in Israel to some extent (Jer 34) and others which regulate it (Ex 21). What Paul is talking about in the Christian home radically subverts the system of Roman slavery. This is because Paul roots obedience of slaves in Christ, decentralizing the power and authority of the master (vv 6-7). Slaves are told to seek to please their masters because they have a responsibility to behave in a Christ-like manner. BUT the master must submit as well. This was unheard of. I want to be clear. This is not a timeless, propositional statement upholding the institution of slavery. It is a specific statement, for a specific group of people within a specific, Christian social setting. As we continue, we will see that Paul is subtly subverting the order of slavery. Just as he mentions the wife before the husband, and the child before the father, he mentions the slave before the master. This is because what he will say to the latter in each couplet will upend the expected social order of each. In each example the patriarchal male is expected to be the absolute authority. Instead, he is instructed to dethrone himself just as Christ did, submit himself in humility under those whom he has the legal right of dominance. Paul doesn’t end slavery, but he certainly cripples any notion that the master owns his slave. Instead, the master is to treat his slave as an equal in Christ. Just as the slave submits to him, he must “do the same to them”. Because we so often stop after 5:33 this is rarely discussed. But what Paul has done is turn the Roman household on its head. Instead of being emperor of his home, the man is Christ of his home. He is to model the humility of the slave, Jesus, who washed the feet of those who owed him the title Lord. He is to abandon his claims to absolute authority and embrace the example of the humbled, kenotic Christ – he who was cursed upon the tree. He must imitate Yahweh crucified. This is a radical claim, but it is not a claim unique to me. It is central to Matthew’s vision – one which recurs in Mark 10 and is reenvisioned in the Eucharist scene in Luke 22. It is the explanation John gives the cross through his own Eucharist scene. It is the model of Christian love upheld in kenosis from Philippians 2. And, as 1 Corinthians 1 and Galatians 3 & 5 tell us, the cross preserves no privilege, but makes all equal before God. Christ submitted to the Church and thus I, as a man, must submit. I must submit to the wisdom and counsel of my wife, to her authority and insight as an interpreter of Scripture and to her challenges when I fail to embody Christ. I must submit to my children. They are not a status symbol or a utility. It is not my place to rule them with fits of rage or a heavy hand. I must not antagonize or belittle them. Instead, I must recognize God’s image in them. I must learn from them, as they have a perspective Jesus called enviable before God (Matt 18:1-9). They are to be protected and cherished. Lastly, I have a responsibility to those my culture tells me are “below” me. I must heed the witness of female voices. I must read female scholars and listen to female teachers, accept their authority in Christ. I must listen to the voice of the oppressed and marginalized, incorporate these witnesses into my life, and treat them as my equal, even as my better according to Philippians 2. And so, as I read this passage, I am reminded that God isn’t calling me to be masculine – a societal construct based in antagonism and power struggles – he is calling me to be Christ-like. Nate, this was excellent. I kind of laughed because you took every passage I am using in the same order with the same argument, for my Master’s thesis which is about authority in leadership. The exact same principles you’ve applied to marriage can be applied to leaders in the church and in para-church organizations. Great job! You cover a lot of different topics here! Words are very tricky things and I will have to chew on this post for a bit. I found myself protesting at some points, but agreeing with your conclusion, so I don’t quite know what that means, lol.